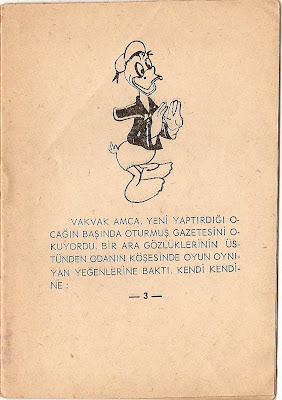 While Donald Duck books began to be published in the US (and also in the UK) since the late 1930s, titles headlining Disney's most famous duck appeared in Turkey much later. 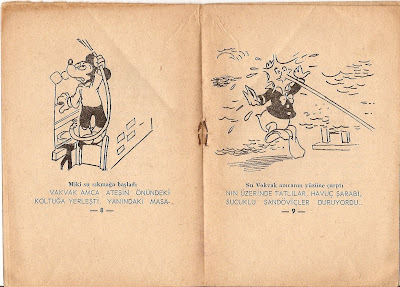 The earliest such Turkish title appears to be Ördek Kardeş Istanbulda [Brother Duck in Istanbul], first published in 1947. A very rare Turkish edition Donald Duck book is Vak-Vak Kardeş Masal Diyarında [Quack-Quack Brother in the Land of Fairytales], a 16 pages-long booklet translated by Turhan Tümay and published by Necmeddin Salman's Kitap Yayma Odası in 1959 as no. 30 of 'Küçüklere Kitaplar' [Books to the Minors] series; I have never seen a copy of this title, all the info I have on it is from the index of the Turkish National Library in Ankara. 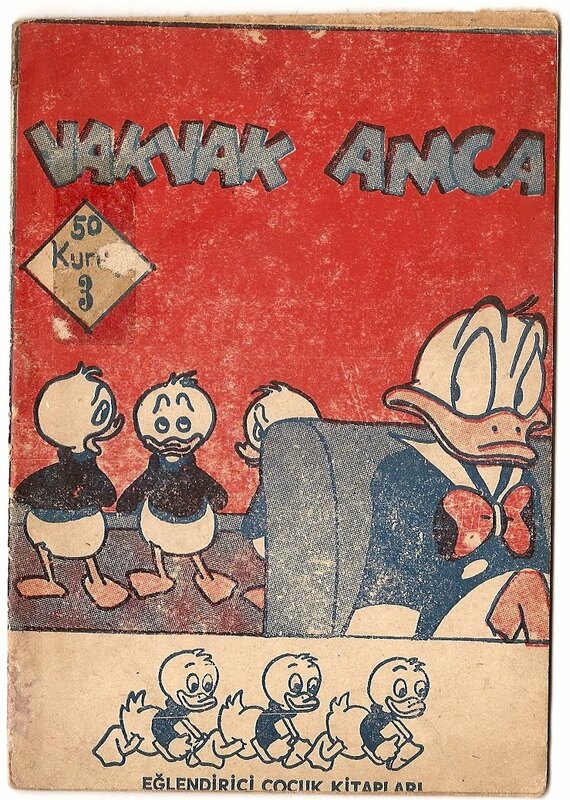 The next in line was Vakvak Amca [Quackquack Uncle], currently the oldest Turkish Donald Duck illustrated story book in my collection. This 16 pages-long booklet was published by Edip Alşar in 1961 as no. 3 of 'Eğlendirici Çocuk Kitapları' [Entertaining Children's Book] series, and distributed by Gazeteci Kitap ve Yayınevi. Edip Alşar is an author of a soccer history book and also of school books for children. 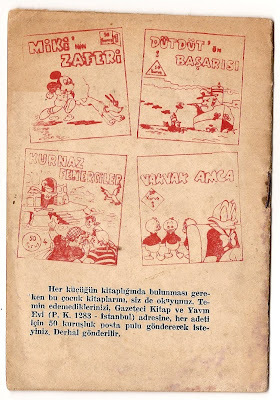 Gazeteci Kitap ve Yayınevi was a short-lived franchise active in 1960-62. It was apparently a miniscule enterprise as only a post box number is given as its adress. 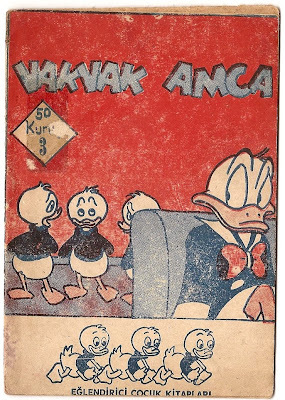 Vakvak Amca features a very ugly Donald Duck illustraton on its first page and two more illustrations in the central pages: The plot concerns Donald deciding to make a feast all for himself, with eventually smoke rising from the kitchen while the food is being cooked. It turns out to be a false fire alarm however as a bird is revealed to have blocked the chimney. Just discovered this and your other Big Bad Wolf blog. Very informative! Very much liked seeing the vintage comic strips. Is there a place to buy Turkish Donald Duck comics online? I am looking for one as a gift for a serious Donald Duck comic collector.